I'm not a coffee person but I love fruit juices and enjoy drinking them in the afternoons. Extract juice from orange and filter it. Grate the carrots or chop them finely. Add it to the blender along with some water and puree it. Filter the puree using a strainer to get clear carrot juice. Do this twice or even trice by adding water to get extract from the carrots. Puree carrots along with a piece of ginger by adding some water to it. Strain the pulp to get clear juice. Squeeze few tsp of lemon and add it to the juice. Stir in some sugar and a pinch of salt to make yummy carrot juice. You can enjoy the juice with just honey and skip the sugar. You can also skip honey and add a pinch of salt and pepper to the juice and have it as a spicy version. 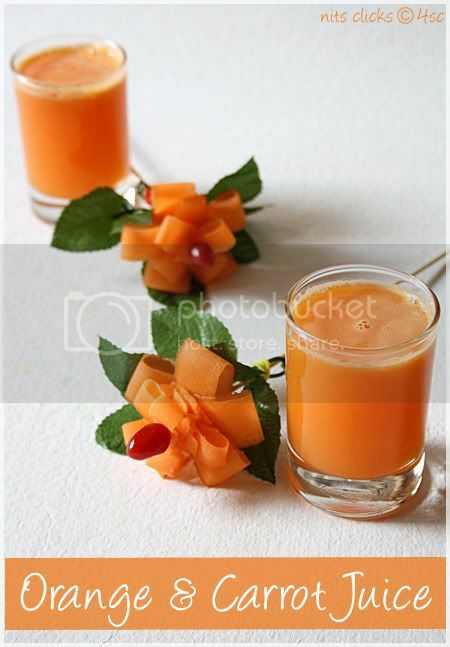 Puree papaya and mix the juice with this juice to get a mocktail version. Carefully Peel long strips of carrot using the peeler. Initially the strips will be thin and once you keep peeling the strips will be wide. Take the wide strips first and fold them into two and punch them into a tooth pick or a skewer. Do the same with five strips of the same width to make one layer of the flower. Move the strips to form a flower shape. Once done, go on with another layer of the flower using smaller strips of carrots. 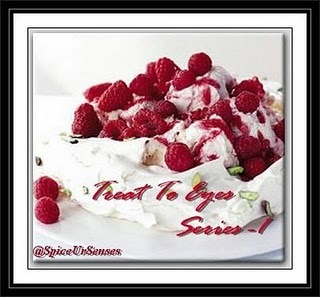 I am happy to send this post as an entry to Rumana Rawat's "Treat to eyes" event. 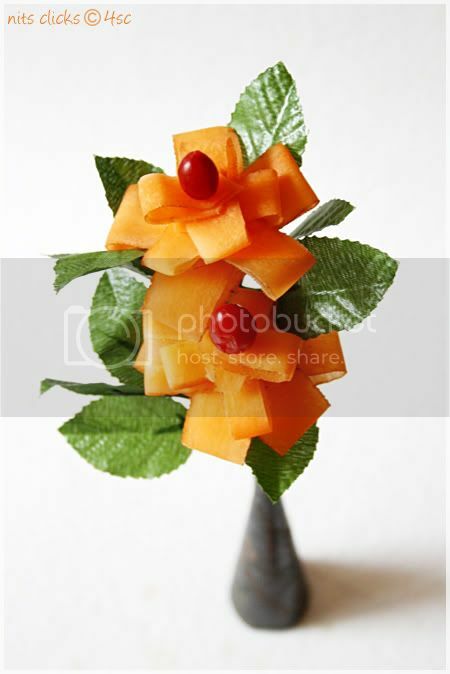 I am also sending my carrot flowers to "Create n Carve" event which originated in Nayana's blog. 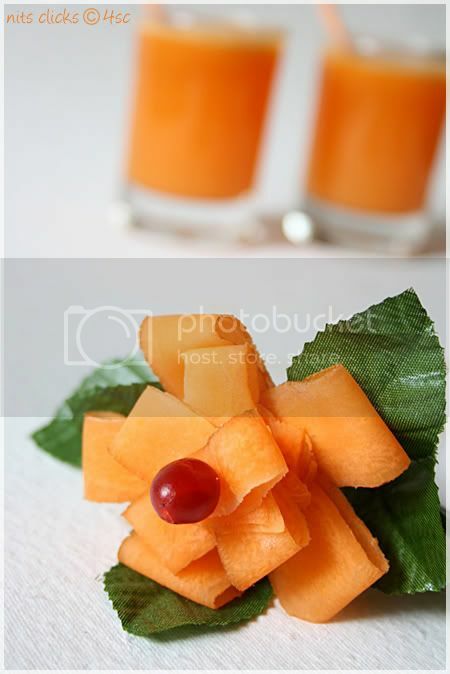 Nice refreshing juice Nithi.. Loooooooooks absolutely yumm and wish if you could pass one glass to me (with the juice) The flower looks very very beautiful.. certainly eveybody will fell love with that cute flowers. What a awesome presentation , why don't u send it to my event. I am not a big fan of Carrot juice but oh that flower...looking lovely!! Amazing clicks nithya. And juice looks colorful, healthy and the flower looks pretty too. 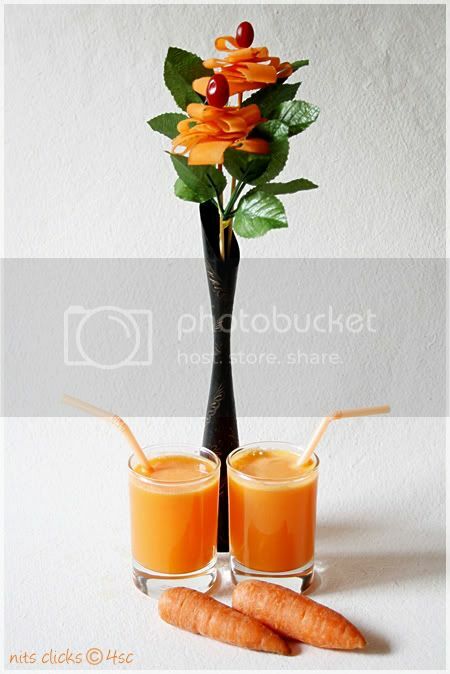 Such a refreshing juice, those carrot flowers looks soo pretty and elegant..
Beautiful carrot flowers :-)) I love them. 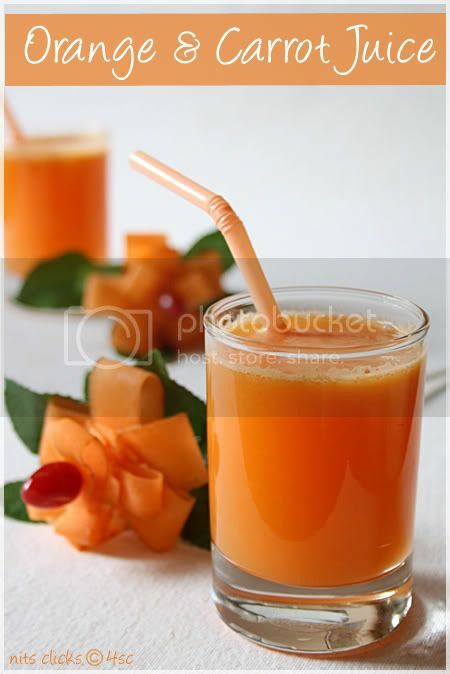 I used to make carrot juice with apples...gotta try with oranges too. perfect looking .wanna grab that glass.so charming. And again, Sorry for the wishing you late..
Looks so refreshing juice..Nice combo of veg and fruit..
Those flower are so beautiful loved it. Lovely combo..all time fav. Juice looks great!! 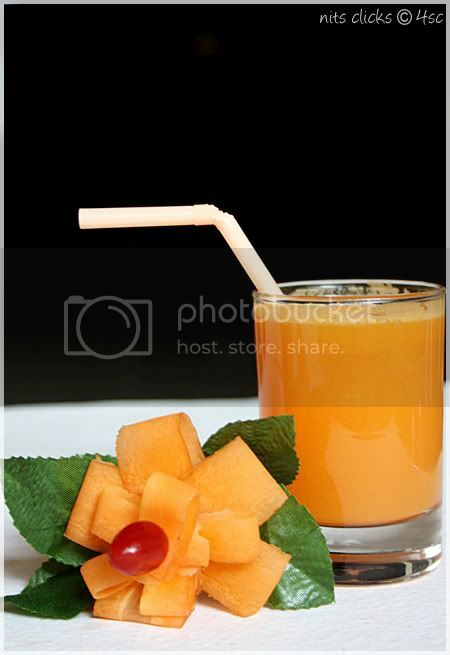 Very refreshing and healthy juice. Lovely color. love the colors...i usually mix orange to carrot juice...so that i can have my kids eat carrots...it usually works... i just love the vegi flowers....it looks perfect for the drink...! !and did i mention ......SUPERB clicks !! Loved the carrot flowers, wonderful creativity. Nice zesty color and lovely carrot flowers. Very colorful and refreshing juice Nithi. Looks delicious. wow!! nithi cute flowers, you r rocking. I also make this but i add sugar, next time i will try usung brown sugar. nithya dear, flower looks superb....healthy drink! Beautiful Flowers Nithya!!! Refreshing Juice!!! Treat to both the senses!!! Awesome presentation n clicks, Nithya...Esp loved the first click! 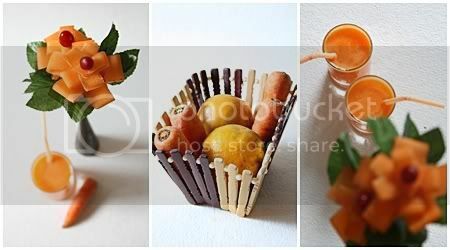 Semma cute pics nithya, Loved the juice and specially the sliced carrot flowers!!! no wonder your mom liked it. I have a question...what is hte general lens that you use for the food pics? Do you use a prime lens? or a variable focal length one? let me know the f length too..
My little one's everyday drink after coming back from school :)... Lovely clicks Nithi! Thanks for taking part in Create and Carve for March, I have finally posted the round up! Wow beautiful vibrant nad refreshing looking juice.The carving is awesome. Carrot juice is one of nature's miracles. It has so many health benefits that its hard to list all of them. 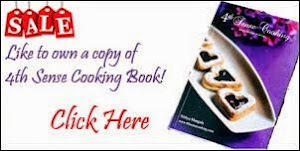 Its great for your skin, hair and general health. What I think is the most surprising benefit tough is its power to cure impotence! After knowing all of that I hope you do make a habit out of drinking carrot juice!